This week's song "(Sittin' On) The Dock of the Bay" is a song co-written and performed by Otis Redding just days before his death in a plane crash. The song went on to become the first posthumous single to top the charts in the US. It charted at number 3 on the UK Singles Chart.Billboard ranked the record as the No. 4 song for 1968. It went on to gain success in countries across the world, and sold more than four million copies worldwide. It won two Grammy Awards: Best R&B Song and Best Male R&B Vocal Performance. 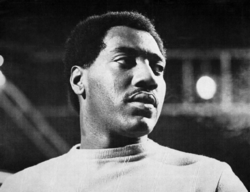 Otis Ray Redding, Jr. ( 1941 – 1967) was an American singer-songwriter, record producer, arranger and talent scout. He is considered one of the greatest singers in the history of American popular music and a seminal artist in soul and rhythm and blues.